The Missing Persons’ Forum holds special Seder in Tel Aviv to raise awareness for the hundreds of missing persons in Israel. A special Passover Seder, highlighting Israel’s missing persons, was held on Wednesday by the Missing Persons’ Forum in Israel. 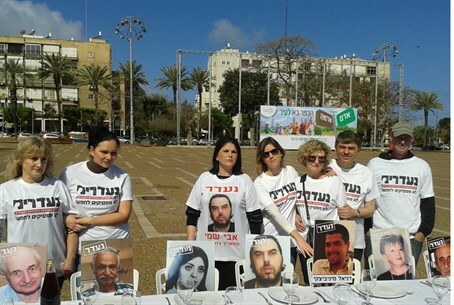 The Seder table at the Rabin Square in Tel Aviv included empty seats for people such as Daniel Minivitzki of Tel Aviv, who has been missing since October, and Adi Yaakobi, who was 16 when she disappeared in 1996, never to be seen or heard from since. Since the establishment of the State of Israel in 1948, there have been 500 recorded and unresolved cases involving missing people. About 20 new cases occur annually. The Missing Persons’ Forum, made up of family members of the missing persons, is urging the public to be aware of reports of missing people and assist in obtaining information about their whereabouts. Wednesday’s event was meant to raise public awareness for the cause, as families of missing persons are asking that the State of Israel anchor their status in law. This would include official recognition and financial aid for the purpose of helping in the search for the missing person and providing psychological assistance for his family, as well as supervision of the various officials responsible for investigating cases of missing persons.